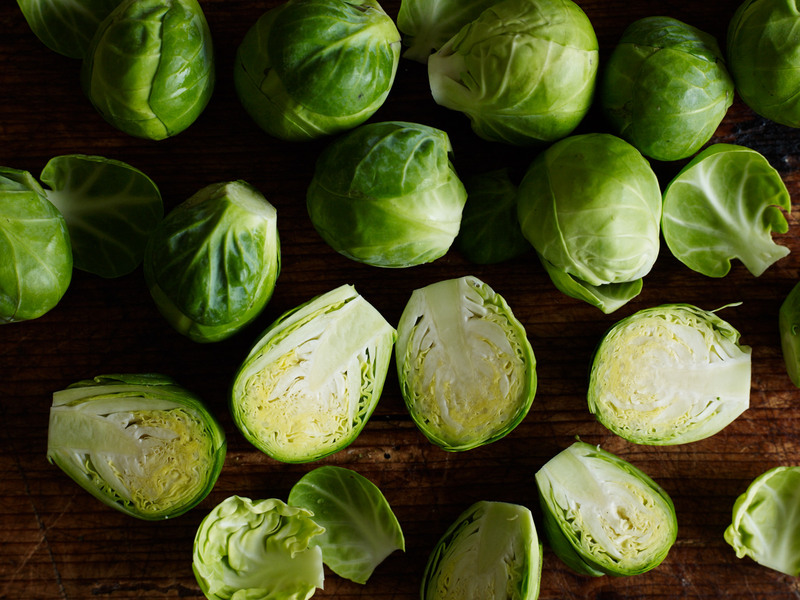 Did Brussels sprouts used to give you the heebie jeebies? If only our mothers and grandmothers had thought to roast them we'd have all loved them way back then. 1 Preheat oven to 200°C. Trim Brussels sprouts and cut in half, or into quarters if large. Line a shallow ovenproof tray or tin (I use a Swiss roll tin/jelly roll pan) with baking (parchment) paper and put in prepared sprouts. Drizzle with 1 tablespoon olive oil, then massage in with the hands. Add nutmeg, pepper and a good sprinkle of sea salt then tilt the paper and gently toss the sprouts around so they are evenly seasoned. 2 Cook Brussels sprouts for about 15 minutes in preheated oven, gently turning them once, or until lightly browned and crisp. Remove from oven and cool. 3 Peel oranges with a serrated knife, then cut in between each piece of membrane and release the fillets of orange. Cut orange fillets in half. Transfer to a shallow serving bowl with walnuts, chilli, chives and mint. When sprouts are cool, add to serving bowl with 1 tablespoon lemon oil if you have it (or extra virgin olive oil) and a good sprinkle of sea salt. 4 Toss gently and serve immediately. It’s fine to use your hands when massaging the sprouts with oil, but avoid doing this once you have added seasonings, or the seasonings will stick to your hands and not the sprouts! 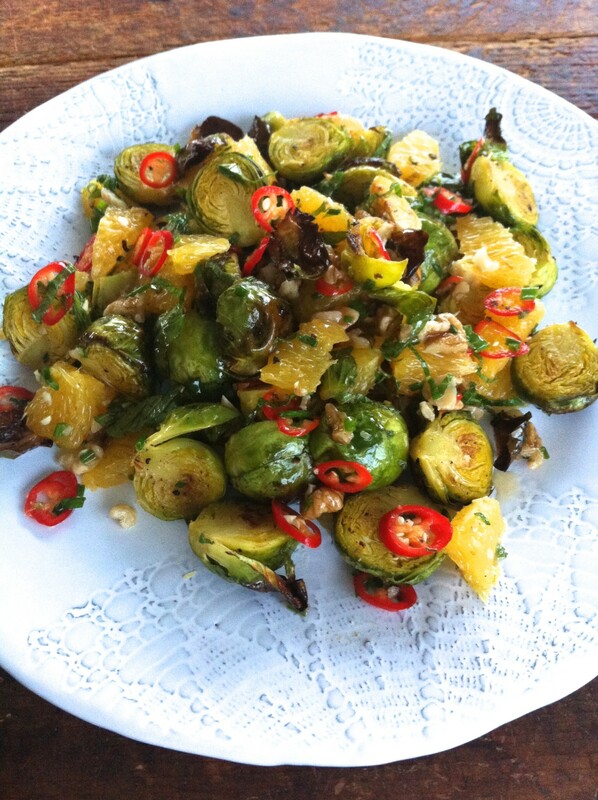 The trick with roasted Brussels sprouts is to get them nicely coloured and crisp, but not blackened or they will taste bitter, and definitely not soft. Give the salad a taste before serving. Sometimes I squeeze over a little lemon juice to brighten it up (depends on whether the oranges have got a welcome sharpish little nip or are sweet). Also see post Hey Bud! Brussels Sprout Leaves – looking perfectly perky! You have to admit these look pretty cute, all bright and shiny. Go on, give them a go! Cheap, abundant and oh so good for you.